Today was my daughter’s birthday. So I thought I should make a doll cake for her. Here is the recipe for the cake. In a large bowl, take melted butter and add sugar to it. Beat them well. Add eggs one by one and beat them. Beat a little after adding every egg. Then after adding the 4th egg beat for a little longer time. In a separate bowl put the flour, baking powder and coffee powder, mix them and sieve them thrice. Divide it into two parts. Add one half of this dry mixture in the eggs mixture and fold in. Then beat. Add the remaining half, fold in and beat well. Grease the pan and put in it, half of the mixture. Bake it in a preheated oven at 180 degrees for 20 minutes. Bake the other half of the mixture in the same baking pan or use another baking pan of exactly the same size. You will get two cakes of this diameter. It is 7”. Let them cool down at room temperature. Put them one on another. Take the cream on a bowl, add 1 teaspoon ground sugar to it and beat for 5 to 6 minutes so that it becomes fluffy. Apply it on the cakes. 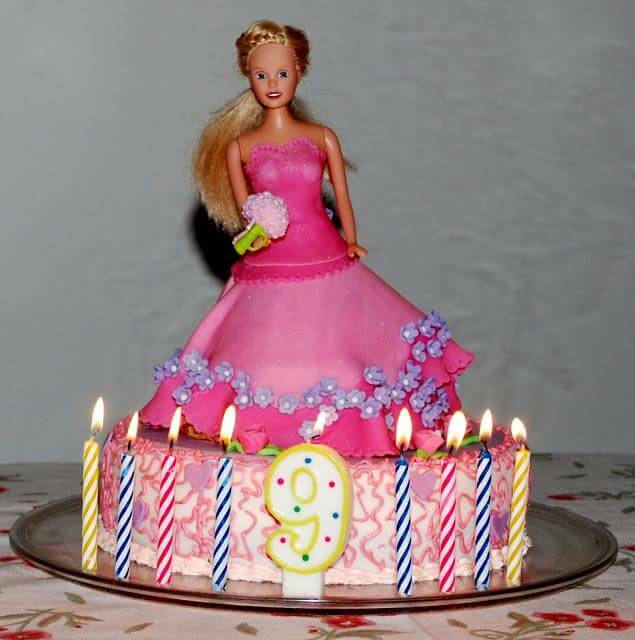 Make a hole in the middle of the cake and insert legs of the doll inside it. You can also add a little chocolate to some of the cream and spread it on the cake to give it a more natural frock-like look. Place it in the fridge for half hour for the cream to settle. This cake tastes really yummy. Everyone today appreciated it. Due to heavy rains and humidity, the cream was not settling on the cake very well. Nevertheless, it was yummy! You will also enjoy it. Tip: I earlier made this cake with chocolate sponge. All I did was; I added 3 tablespoons of cocoa powder instead of coffee powder in the mixture. So if you prefer chocolate, you can use cocoa powder instead.